We were seven minutes plus stoppage time from progression in the FA Cup on Saturday before Leicester City started a comeback that culminated in a complete turn-around. Spurs dominated possession in the first half without creating too many openings, whilst Leicester were happy to soak up pressure and counter – doing so effectively and creating good chances. Andrej Kramarić had an opportunity to put Leicester 1-0 up, with Danny Rose failing to cover round despite having a good view of the forward. Michel Vorm’s save was exceptional – the sort that we have become accustomed to with Hugo Lloris in goal. Leicester’s second chance summed up – for me – why Mousa Dembélé and Étienne Capoue are an ineffective central midfield combination from a defensive viewpoint. In the above image, Jeff Schlupp has received the ball, brought it down and Vlad Chiricheș/Andros Townsend are approaching him. Neither Dembélé or Capoue are attempting to get into a defensive position to influence the game – presumably assuming that their team mates will deal with the situation. I have long been of the opinion that neither has particularly good natural defensive instincts, and this is a good example of that. Younes Kaboul has to keep one eye on Leonardo Ulloa, who has played the pass and is now getting forward to support Schlupp and Kramarić. As Schlupp cuts in, there’s a huge gap in the centre of our defence. Either Capoue should have tracked Ulloa, allowing Kaboul to go across to the ball, or one of Capoue / Dembélé should anticipate the potential danger and get into a position to stop Schlupp having a free shot on goal. 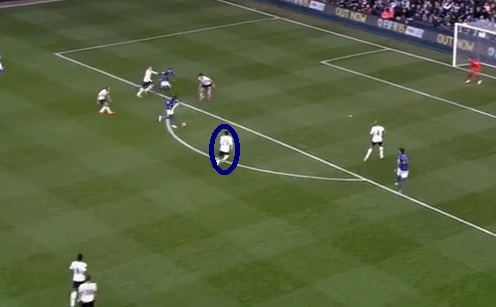 Presented with the same scenario, I would expect that Stambouli would have provided a more effective barrier. At the other end we struggled to break down a stubborn Leicester defence, with all three of our central midfield players content to pass sideways to the wingers and give them all of the responsibility of getting in behind the defence. Lamela and Townsend actually achieved on occasions, but having provided openings, Paulinho was guilty of wasting them. His finishing was allegedly an in-joke at Hotspur Way last season, where it was said that he put lots of balls over fences. Based on this display it is easy to see why. He lacked composure and technique and wasted three presentable chances – one going wide, one over, and one straight at the goalkeeper. Mauricio Pochettino has made some useful substitutions this season, but on this occasion his decisions did not help the situation. At 1-0 and with Leicester gaining a foothold in the game, it had become clear that we were going to need a second goal to kill off the tie. Bringing Christian Eriksen on, then, was a logical move. Taking Townsend off, however, was not. Townsend was having some joy on the right and was looking capable of creating something, especially on the counter. It would have made more sense to take off Paulinho or Dembélé to allow Eriksen to scheme in behind Roberto Soldado. Instead, Eriksen was played on the left, with Lamela switching to the right, and the ineffective Paulinho continuing in the centre (I won’t refer to him as a number 10 as he doesn’t possess any of the qualities of the traditional 10!). Emmanuel Adebayor then replaced Soldado, which felt a little odd, as Soldado had passed the ball quite well and had won the penalty with an excellent piece of control. Adebayor added more of an aerial threat – challenging for and winning headers, as opposed to jumping into the man and giving away free-kicks as Soldado tends to do – but he undoubtedly slowed down our attacking play. Harry Kane’s introduction for Dembélé after the equaliser was too little, too late – ideally he should have come on for Soldado or Paulinho at the same that Eriksen was introduced. Vorm’s dreadful error at the end was not his first mistake of the game and, in truth, he was quite lucky to still be on the pitch. Replays showed that he took Kramarić’s back leg rather than the ball in the first half, which should have led to a penalty being awarded and probably to a red card being shown. Overall it was a disappointing result made more disappointing by the other upsets – this presented a fantastic opportunity to progress in a third cup, and the boos at full-time illustrated the frustration having been in a controlling position. Pochettino has had to manage his squad carefully to mitigate against fatigue creeping in, which can cause long-term injuries as well as limiting players’ effectiveness (as was so clearly visible against Crystal Palace). But, personally, I don’t feel that we can afford to leave out Eriksen, Harry Kane and Ryan Mason. With none of them in the team we lack a player who can consistently pass forward or open up a defence. My preference would have been to play one of Kane or Eriksen against Sheffield United and the other against Leicester. It will now be interesting to see the team selection on Wednesday – both should start and both should feel relatively fresh. A good analysis. Paulinho did get on the end of things though, so at least credit him with that. I certainly agree that playing 3 central mids was an error. I didn't feel the defence did much wrong (Rose was his usual mixture of the great and the ugly) although Vlad spoiled a good game generally with a late error. I get so frustrated with Dembele not really getting forward aggressively as his talent dictates he should. For me Adebayor should have played the 90, why not? we couldnt play Kane and Eriksen so it was time to find out whether Ade's appetite is back (if only for one match!). Yeah, he got into good positions and blew it. Agree about Vlad's good game (bar the slip up) - think he's quite an underrated player for us. Not amazing, but generally more solid than he's given credit for and a good user of the ball. We're missing Bentaleb but playing Stambouli vs Leicester would have been a sensible idea methinks. I really don't know how Paulinho gets away with poor performances week after week. I mean any other player would have been given the boot a long time ago. I have always believed that because he is from Brazil and Spurs were robbed of 17 million pounds that he has been let off the hook, or somehow conned Pochettino into selecting him. In reality, he is no good at any aspect of football, whether it is defending, attacking, passing, dribbling or shooting. He really needs moving on! This was definitely Poch's 2nd team. Interesting that Dier seems to be in the 1st team. Dier is better than Fazio I think. With so many games it made sense to me to alternate 2 teams. The team he played should have won but Paulinho is worse than playing nobody. That should be his very last chance IMO. Pick from the academy players rather than him. Kaboul is also borderline. Close call between Dier and Fazio as to who is the first choice... Dier's been near enough faultless at centre back!